Tech Cocktail is a media partner for the upcoming Sime MIA 2014 event, Dec. 1-2, 2014. Creating an online platform to empower people civically through engagement is an ambitious task. Especially when young voters feel they don’t have much of a stake in society. This summer, Sean Parker announced in Tech Crunch the Brigade Media acquisition of Causes and Votizen. Brigade has not disclosed much information about the new company, except that Parker stepped down as interim CEO at Brigade to remain as chairman, as Matt Mahan became CEO. 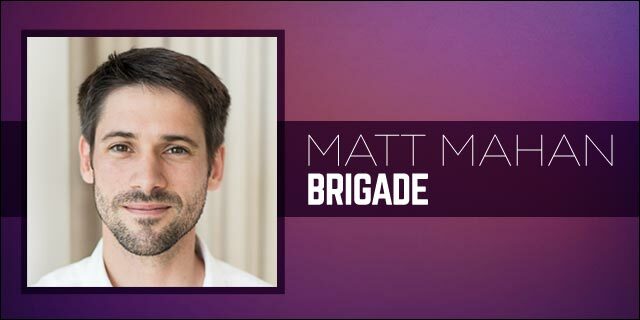 Brigade is set to launch in 2015, but Mahan gave Tech Cocktail and exclusive interview about the future of Brigade and his upcoming conversation with The Knight Foundation‘s CEO and President Alberto Ibarguen at Sime MIA 2014. Camila Souza: How did you get involved in politics and technology and ultimately end up at Causes and then as CEO of Brigade? I’ve been fascinated with politics since the ‘92 Election when I was 9 years old and I couldn’t quite wrap my head around the difference between [President] Bush, Clinton and Perot. And I’ve been interested in science and technology even longer, starting with outer space, sharks and all of those topics that really captures kids’ imaginations. I didn’t even think about combining the two until I was in college, where I was constantly organizing campaigns for one idea or another that I believed in, such as a living wage for our janitorial workers. During my junior year, Mark Zuckerberg and a few other guys in my dorm started Facebook, which was very simple at the time, but to me was a promising platform for organizing people. In fact, I believe I organized the first campaign to use Facebook data, which is another story. In terms of Causes and Brigade, I didn’t immediately jump into tech after graduating. I spent a year in South America and two more with Teach For America, and was actually on my way to law school when Zuck[erberg] and another college friend, Joe Green, convinced me that I could have a much larger impact on society by using technology to build new solutions to the old problems that frustrated me. That vision took me to Causes and then on to co-found Brigade, where we’re working to put people back at the center of our political process. C.S: Let’s talk about Brigade’s acquisition of Causes and Votizen earlier this year. It seems like a strategic move, so what is the overall vision? You’re right, the acquisition helped us spin up our team quickly with talented and mission-driven people and the network Causes built will be helpful as we bring Brigade to market. Our vision at Brigade is to connect the world’s citizens around the issues they care about and give them tools to tap into their collective power to get things done, especially via the political system. We think that building a platform that connects like-minded people with each other, their elected officials, outside organizations and all of the rich civic data at our fingertips is the only way to overcome the two-headed monster of complexity and cynicism that plagues politics today. C.S: Brigade impressively raised $9.5M in the first round. Is there an added pressure to launch a successful product? We’re thrilled to have raised a substantial round earlier this year from angel investor Ron Conway, Salesforce Chairman & CEO Marc Benioff and our Executive Chairman Sean Parker. In addition to being influential and well-respected leaders in the tech sector, they are each passionate about putting people back at the center of our democracy. Their support allows us to begin building an infrastructure powerful enough to elevate the voices of individual citizens and improve the relationship between elected officials and their constituents. There’s certainly pressure to deliver a useful product from the outset, but we also remind ourselves that changing American politics is not a two or three-year project. In reality, it’s not even a one-company or one-idea project. We’re going to relentlessly pursue the goal of connecting all citizens and we hope that others jump in to tackle the problem from different angles as well. C.S: How do you plan to keep the platform nonpartisan and an open forum for critical discussions? Just like Facebook and Twitter, we’re building a platform for others to form connections, share information and take action. Outside of having a standard terms of service agreement, we won’t be putting ourselves in the position of saying that one idea is better than another. That’s for the people using our product to determine by deciding where to engage. We do think it’s important to keep the conversation civil and productive. To that end, we’re investing a lot of development resources in real identity and helping people connect with like-minded contacts who want to work together on something. Finally, it’s worth nothing that we’ll be launching on iOS, Android and web because we think it’s important to make the platform accessible to as many people as possible. C.S: Why is “American democracy” not scaling? Voter apathy or government is not up to date with technology and how people communicate? Solutions that work at one scale often break down at another. When our country was founded, there were about 40,000 constituents per House Representative, and the average citizen was represented by only a handful of elected officials at all levels of government. Even then, I imagine it was hard to be consistently informed and engaged. Today, each House Rep has over 700,000 constituents and the average citizen is represented by roughly 50 elected officials. The complexity of the current system is overwhelming, especially when you factor in the hundreds of thousands of PACs, advocacy groups and lobbyists that also play a key role in shaping who represents us and what decisions they make. It’s no wonder most of us are turning away from civic life and hoping that someone else is looking out for our best interests. Unfortunately, that’s often not the case. C.S: What role can the Internet play in reversing “voter apathy” for today’s youth? It’s apathy, but it’s also cynicism. People don’t believe that their government is looking out for their best interests, able to follow through on them, and capable of withstanding the influence of powerful groups that might not agree with them. Apathy is, “Who cares?” but what I hear from a lot of people is frustration and anger. They care, but they’ve lost faith in their power to fix it. But if you think about how democracy works, the only power any of us have is through acting collectively. The Internet is the world’s most powerful technology for connecting people and getting the right information to them at the right time, so we think there’s a tremendous opportunity to overcome that cynicism by showing people that they can act together and that by acting together they can have an impact. We need to build a positive cycle of engagement to replace the negative cycle we’re stuck in. C.S: What is wrong with how we pick our leaders today? A number of things. For starters, most of us aren’t picking our leaders at all. This is especially true at a local level where there are hundreds of thousands of elected leaders across the country who get elected with extremely low turnout. If 50% of eligible voters vote for governor, you’re probably looking at 15% for school board and transportation board. These folks oversee literally trillions of dollars in spending on core services that affect our daily lives and yet most of us can’t even name who they are, much less what decisions they’re making. So there’s a real lack of awareness and accountability. Second, for bigger offices we have what Lawrence Lessig calls a “money primary” before the actual primary in which PACs and big dollar donors get to narrow the field of “viable” candidates before voters even start tuning in, so that significantly limits our choice. Third, as voters we do a terrible job of connecting what someone does (or fails to do) while in office with whether or not we vote for him or her the next time around. In all, you have a system in which leaders are no longer accountable to the people, as originally designed. C.S: In your opinion, what digital tools available today have proven to empower young voters? There are a lot of good people working on different aspects of the problem. I thought that Rock the Vote’s “Turn Out for What” video before the recent midterms was brilliant, and I’m impressed by how on the political left Upworthy has sparked conversations. There are also interesting nonpartisan startups in the space, like PopVox and Countable, that are helping people understand what’s happening in government and letting them weigh in. These are all promising developments. I think the hard part is getting to a scale that ensures people’s voices and votes have real influence. To do that as a tech platform, I think you have to be about more than politics. You have to start with the issues people care about and find ways to keep them engaged in a sustained way. That’s a real challenge in our generally short-term and scattered digital world, but I’m hopeful that Brigade will provide a platform for people to cultivate an ongoing civic life. C.S: Miami is becoming an active city when it comes to politics. Any advice to people who want to be more civically engaged? If you can find the time, volunteer on a campaign and get to know the people running it. When I started getting involved in local campaigns I was surprised to find that in every city there is a small core of citizens who are incredibly well informed and engaged. As you might expect, they feel really empowered as citizens because they actually are. It’s the opposite of what the rest of us feel most days. You don’t always win, but the experience of working with other people to support a candidate, and more importantly, a set of ideas that you believe in can be a very powerful experience. And it’s more fun than you’d think. It’s a little like being on a sports team, but the consequences are much greater. For some people the starting place is community service or attending a city council meeting. For me, it was campaigning. Whatever it is, you do have to give some time and energy to it. I think a lot of people are looking for that “civic pill” that you just pop once a day and you’ve done your part. Sure sounds nice, but it’s not how life works unfortunately. You have to get out there and start meeting others who care about your community as much as you do. C.S: Prior to SIME MIA, have you visited Miami’s tech community? If not, what are your expectations? My wife Silvia grew up in Miami. Her family and many of our closest friends are here. I love this city. Whenever we’re in Miami I work out of The Lab (which my sister-in-law’s fiancé, Danny Lafuente, co-founded) and of course I spend more time than I should over at Panther Coffee. I think what’s going on in Miami right now is very exciting—there’s a palpable energy as our generation starts new companies and comes up with new solutions to old problems. Wynwood feels like parts of San Francisco to me. I’m just thankful to have a direct connection to it and am honored to have an opportunity to speak at Sime MIA this year.